Prior to the formation of a fire department, the City of Troy and surrounding communities suffered years of devastating fire losses at many homes and businesses. Some of the businesses destroyed by fire were The Laclede Hotel, Troy Roller Mill, Trojan Hatchery, and the Trails Inn. In 1938 Troy voters passed a bond issue which would finance the purchase of firefighting equipment. In 1939 the City received it’s first fire truck, via grant from the U.S. Government. The new truck boasted a 500 gallon per minute pump, 1,000 feet of 2 1/2 hose, 150 feet of 1 1/2 hose, wooden ladders, and axes. The truck was housed at the first fire station, located at 451 Main St. in Troy. 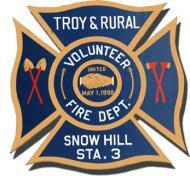 Troy & Rural Volunteer Fire Department was officially formed in 1949. This was also the same year that insurance regulations required there to be two fire trucks inside city limits at all times. On December 8, 1949 at a City meeting, residents donated $4,500 of the $7,000 needed to purchase an additional fire truck. The remainder of the funds were raised and the new truck delivered in April of 1950 with a final price of $8,027. With the second fire truck came the need for a larger fire station. The station was moved from Main St. to Cherry St. (near the car wash) for the next 27 years. In 1979, the Troy & Rural Volunteer Fire Department moved to 244 Firehouse Lane in Troy. In 2008, the Lincoln County Fire Protection District #1 moved to 700 E. Cherry St. where they are located today.